it’s about real people like them. And they discover first-hand that history can be fun! Students find out how families like the Faulkners lived at the turn of the last century, how “modern technology” changed the world 100 years ago, and how the Civil War affected local people — including young Clay Faulkner, who was a “secret soldier” during that conflict. A Vice-Principal from Memphis once called Falcon Rest’s George McGlothin an “edu-tainer.” The different historical characters he plays capture kids’ imaginations, so students are learning while they’re laughing. Games in the gardens call be added if more time is available. The old-fashioned merchandise in the Victorian Gift Shop makes it a history lesson in itself. For even more local history, put our Gent on the bus as a step-on guide for a trip to beautiful Rock Island State Park. Choose from three interactive history-based shows that make your students real people from the 1800s. 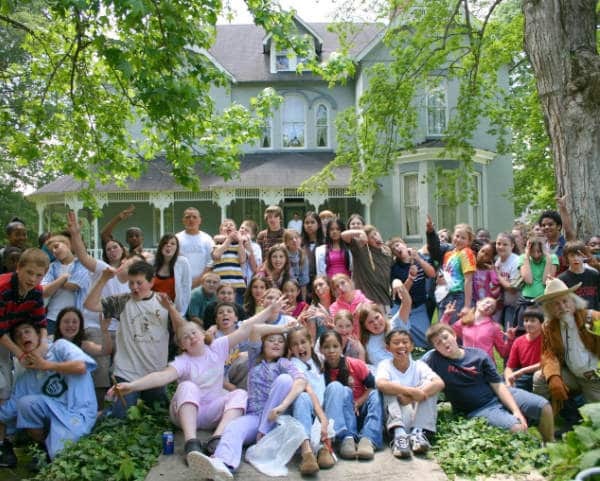 Your students are the real stars of our original interactive murder mystery show. They assume the characters of actual people from 1897 attending a banquet given by the Faulkners to celebrate the opening of their new mansion. There are no lines to remember, so they’re free to ad lib as much or as little as they like … and they can be counted on to come up with some pretty hilarious dialogue. When a dastardly murder mars the celebration, they help special guest Buffalo Bill Cody discover the culprit! 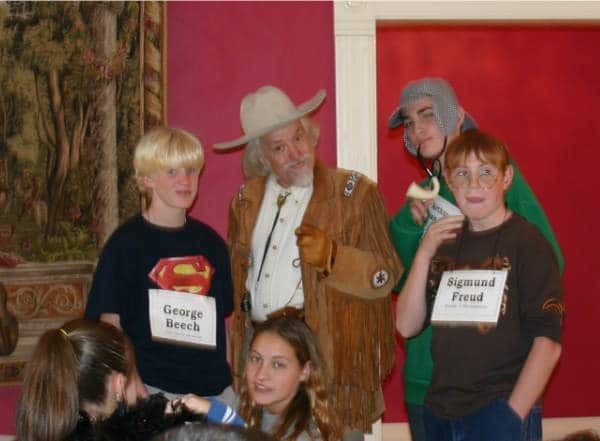 Students will never forget the historical characters they played. Designed to tickle the funny bone more than tingle the spine, this interactive show combines stories of the suspected “spirits” at Falcon Rest with a light-hearted ghost convention … where your students are the ghosts! Anyone no longer living could show up, from Henry VIII to Lady Godiva to Elvis, so students portray people from all eras of history. The show ends with a surprise twist and is followed by a meal and mansion tour. Ideal for an October field trip. Based on first-person accounts of Civil War events in McMinnville during the spring of 1863, this interactive show is hosted by Gen. John Hunt Morgan, who later took his raiders farther behind Union lines than any other Confederate commander, and local poetess Lucy Virginia French. Students assume the roles of Morgan’s 21-year-old bride Mattie, local citizens and Morgan’s soldiers. 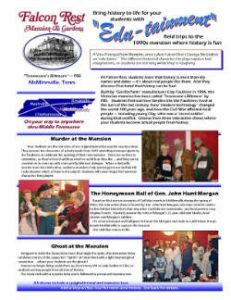 It’s set at a banquet and ball given to honor the Morgans and ends as 6,600 Union troops invade McMinnville to capture the General. The Civil War comes to life. 20 person minimum for “Murder” and “Honeymoon Ball” shows. 40 person minimum for “Ghost” show. Spaghetti with meat sauce, cheesecake brownie (chocolate cake with white icing for “ghost” show), rolls and beverages.